Come and explore the William C. Mearns Centre for Learning - McPherson Library. 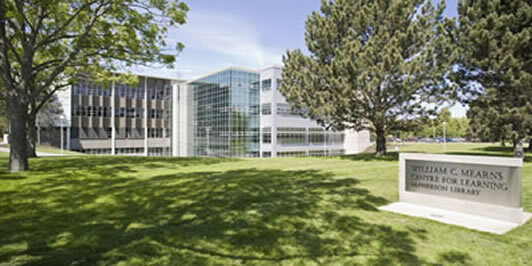 McPherson Library is a key component of the William C. Mearns Centre for Learning. The William C. Mearns Centre for Learning expands the ability of the UVic Libraries to meet the increasing need for resources, services and space. 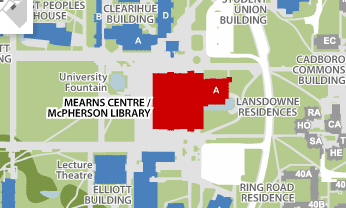 The Mearns Centre houses the Bessie Brooks Winspear Music & Media Commons, a new University Archives and Special Collections space and an expanded Learning Commons. We offer support services such as E-learning, Learning Skills and the Centre for Academic Communication to provide students with academic assistance. These programs build upon existing services provided by the library for the campus community. Also, our BiblioCafé provides a needed social space and an informal study area. Come and explore the Mearns Centre - McPherson Library to pursue your scholarly research, to work on your media projects, or simply to relax and enjoy a cappuccino in the BiblioCafé.